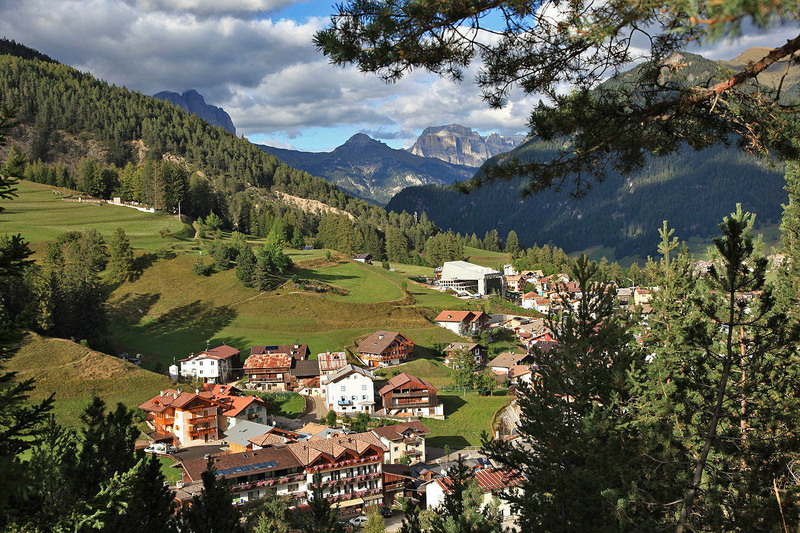 The town of Vigo di Fassa is among the largest and sunniest in the valley. Situated at the foot of the Catinaccio, in a dominant position, it is directly linked to Bolzano – just 35 km away –through the Costalunga Pass (also called the Carezza Pass or Karerpass), part of the municipality of Vigo di Fassa. From the town centre, a cable car takes visitors, in just a few minutes, to the Ciampedie, a real garden and balcony overlooking the Dolomites with scenery unique in the world. Mention must also be made of two splendid ancient gothic churches: Santa Giuliana, patron of the valley (early-16th century) and the parish Church of San Giovanni (second half of 15th century) located in the old namesake village – the very best example of the valley’s religious and artistic heritage. The Catinaccio is without a doubt one of the most famous hiking areas in the Dolomites, thanks to the charm of its landscape and sheer size. Listing the many possibilities provided by this wonderful corner of the Val di Fassa is almost impossible in just a few lines. Let us just mention some: the Torri del Vajolet, the tour of the Antermoia and the Roda di Vael. Non-hikers might prefer to simply take the cable car as far as the Ciampedie to admire what is one of the most beautiful mountain landscapes in the world. On this large, natural mountain balcony are 5 mountain lodges and a fun-park for children, if you so wish under the surveillance of specialized personnel. A very easy walk for anyone is that between the Ciampedie and Gardeccia. For more discerning hikers, Gardeccia is a great departure point for more difficult hikes to high-altitude lodges like Vajolet, Re Alberto, Passo Santer, Principe, Antermoia and many others. Please also visit our Nordic Walking pages. The town of Vigo di Fassa is directly linked to the Catinaccio Ski Area. 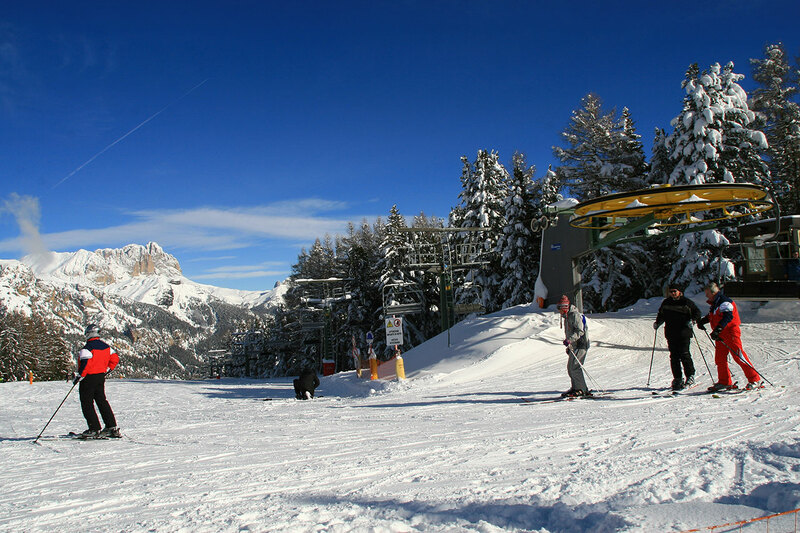 The Catinaccio ski area can be reached by means of the cable car which departs directly from town and climbs up to the Ciampedie, a scenic balcony over the Fassa valley and the Dolomites. At an altitude of 2000 metres, from the Catinaccio range, visitors can enjoy beautiful views of the Sassolungo, the Sella, the Marmolada, the Sasso Vernale, the crest of the Costabella, the Buffaure, the Monzoni and the Vallaccia, with in the distance the Latemar range, the Pale di San Martino and the Lagorai. The ski area offers 13 km of ski runs and is well equipped for families. There is in fact a large Baby Park where children can attend the Vigo di Fassa Ski School which organizes ski courses, and the Mini Club, where they are sure to enjoy themselves. Great fun and testing is the Thoeni slope which extends for 4.5 km from the Ciampedie to Vigo di Fassa. More discerning skiers can try the black run dedicated to Alberto Tomba. The great champion trained for many years on the Ciampedie, much to the pleasure of his many skiing fans.